On Feb. 6, 2016, staff, students, and parents participated in the building of a greenhouse in Campbell's courtyard. 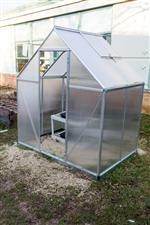 The greenhouse will be used to teach students about greenhouses and the plant cycle as a learning expedition. The building of the greenhouse was featured in the March 6, 2016 edition of APS Green Scene. On Sept. 20, 2014, staff, students and parents participated in Campbell's first garden workday of the school year. The day was featured on the Sept. 26 edition of APS Green Scene. As an Expeditionary Learning School, we are committed to creating authentic learning experiences for our students and nurturing a respect for nature. Campbell Elementary School’s Wetlands Learning Lab allows Campbell to expand its hands-on, inquiry-based approach to education. The Wetlands Project was also highlighted on APS Green Scene.